When I think back to Saturday 11th May 1985, I should have been rejoicing the end of a particularly bleak chapter in the ever-changing drama that is my beloved Southend United. A late penalty by Steve Phillips had beaten Torquay United at Roots Hall, thus saving the Shrimpers from the indignity and uncertainty of having to apply for re-election to the Football League. Like I said, I should have been rejoicing; but along with football supporters all over the country, I wasn’t. The whole day had been quite dramatic, as the last day of any football season tends to be. Southend’s plight was quite serious. If they failed to stay in the League this would surely be the end of the club. Results were terrible, and attendances were well below the 2000 mark - in fact, the 1700 - strong crowd that turned up for the Torquay match was one of the biggest of the season. Even my cousin Wayne, a big West Ham supporter, had made the pilgrimage from East London to help the Shrimpers' cause. Manager and former World Cup winner, Bobby Moore, stated in his programme notes that he knew things were at their blackest at the moment, but assured us that the darkest hour is just before the new dawn. Come 3pm on that fateful day the tension was quite unbearable. Outside Roots Hall stadium the world went about its every day business, but inside the ground none of that mattered. Our own desperate self-importance had taken over our lives, the week leading up to the game had been any supporter’s nightmare, now we had just ninety minutes for players and supporters to save us from the unthinkable and possible oblivion. The game produced very little in the way of quality, as tends to be the way with these affairs, but as half time approached news started to filter through that would put our entire season into perspective, let alone that day's final outcome. I remember having one ear to the radio and hearing that there had been an incident at Bradford City’s Valley Parade ground and the match had been stopped. City were celebrating the climax of a wonderful season in which they had clinched the Third Division title. 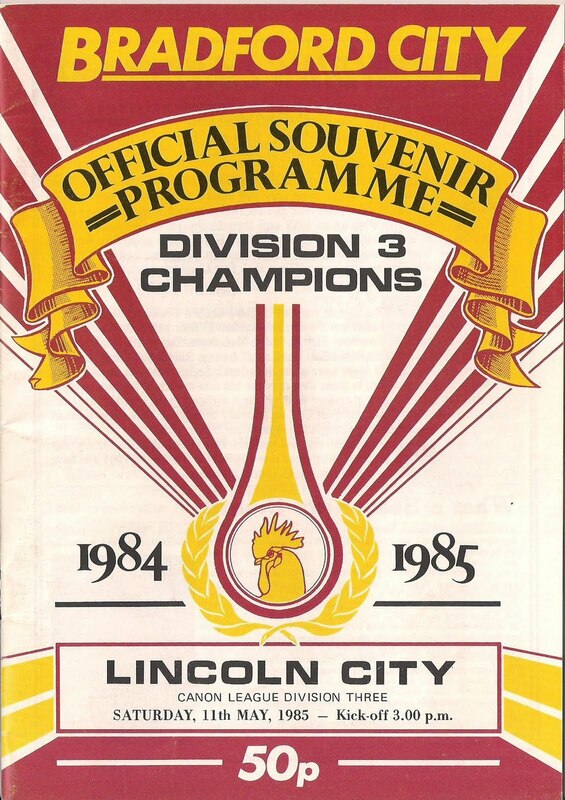 Today they would receive the Championship trophy and then put fall guys for the day, Lincoln City, to the sword in front of a crowd of more than 11, 000. A far cry from the scenes 200-odd miles away in Southend! 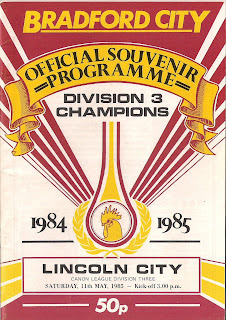 The Bradford City match programme for the 11th May 1985 proudly boasted the heading “Third Division Champions”. Ironically, the next match at Valley Parade advertised on the pages in between was set for the following day, when Bradford Fire Fighters would take on a team consisting of ex-Bradford City and Park Avenue players. Little did readers realise that the brave firemen of the City would be appearing at the ground a lot sooner than they anticipated. The first signs of smoke seeping through the wooden floor boards of Bradford City’s old grand stand appeared at about 3:40pm. Within four minutes fire had taken hold and indeed the lives of people who had just simply gone to watch a game of football. 3:45pm at Roots Hall, Southend. First news had started to reach us on the terraces via radio, but with our destiny still in the balance people took little notice, after all why should we? Bradford City were Third Division champions and were hardly likely to cast an eye down upon poor old Southend. The painful truth is that those of us standing on the Roots Hall terraces still did not realise the scale of awfulness and tragedy that was unfolding up in Yorkshire. The fire had engulfed the stand in a matter of minutes, now the desperate struggle to evacuate and preserve lives was at its height.It was clear to everyone that a number of people had not survived. Match commentator John Helm (a Bradford Park Avenue supporter), who was covering the game for Yorkshire television, was clearly very emotional as he delivered a report that he would never forget, describing it as “a catastrophic sight for Bradford City Football Club,” and adding, “this is human tragedy, this is a burning hell”. Bradford City’s biggest day since winning the Third Division (north) some 56 years earlier had turned into one of the worst disasters in the history of world football. After 77 minutes at Roots Hall, Southend’s leading marksman Steve Phillips converted the penalty that would guarantee the preservation of League Football in south east Essex. The players and supporters took one collective deep breath. Once again, to us nothing else mattered! By the time the dust had settled at Southend and I had arrived home, it was around 6pm. It was only then, faced with television news pictures, that I realised the full horror of what had taken place at Valley Parade, Bradford. Film footage of a policeman with his hair on fire as well as a poor soul staggering away from the inferno completely alight before fellow fans and police officers dashed to help him will live in my memory for ever. Despite the supporters heroic efforts the man would lose his battle for life later that day in hospital. I didn’t go out that night, I just sat numb in front of the television. Stories unfolding of how people had become trapped and lost forever, each story seemed more tragic than the last. The next morning I was off to football again. I caught an early train heading for the Black Country to take in a testimonial for former Walsall player George Andrews at Tipton Town FC. As I made my way down the road, still somewhat sleepy, I asked myself if I’d just had some kind of terrible nightmare?On the way to Rochford railway station I picked up the early edition of the Sunday paper. On reaching London I brought another, and then again when reaching Birmingham. In each tabloid the death toll had risen - it eventually halted at 56. The tragedy had shown no mercy. Men, women and children had lost their lives. The human cost affected both Bradford and visitors Lincoln. Despite the best efforts of the players at Tipton that afternoon, the crowd's mind was elsewhere. Walsall like Southend had been regular visitors to Valley Parade - perhaps the shock amongst lower league supporters was greater as it had been one of our own who had suffered? The weight of human support was quite incredible. Football matches were arranged to raise funds for the families of victims. A recording of the song “You’ll never walk alone” sung by “The Crowd” raised in the region of one million pounds. Bradford City moved in with Rugby League neighbours Bradford Northern (now Bradford Bulls) after playing a handful of games at Huddersfield and Leeds. They would return to Valley Parade on 14th December 1986, when City took on an England XI to re-open the stadium. For once, the words of legendary Liverpool manager Bill Shankly, who famously said, “Some people think football is a matter of life or death. Its far more important than that!” seemed to pale into insignificance. However, in one of football's darkest hours players and fans united in support. In the 25 years that have followed that fateful day, Bradford has experienced all of football’s highs and lows – reaching and briefly surviving in the Premiership before crashing back down to the fourth tier of the English game in double quick time. But none of the on-field drama will ever erase the memories of the 11th May 1985. As I’ve said before, I should have been rejoicing a famous victory that day, but the football match I’ll always remember will be that one in West Yorkshire that I didn’t attend.